THE Web site Managing IP (MIP) is nowhere as bad as IAM, the EPO‘s mouthpiece of choice which sets up events for the EPO (funded in part by the EPO’s truly malicious PR firm). “Their fear is probably an informed public which is abreast of their protectionist schemes (like ISDS).”Patent ‘elites’ must heed the warning of populist rage against injustices like the UPC, but they don’t. They just try to keep things more of less secret or in the shadows. Their fear is probably an informed public which is abreast of their protectionist schemes (like ISDS). Based on IP Kat‘s “Friday Fun” [sic], MIP sets up a dubious event (covering “UPC and Brexit”). It is encouraging the attendance of patent maximalists and, as usual, leaving critical voices shut out through prohibitive costs and no chance of a speaking position, impact etc. Here is the direct link and here is how IP Kat put it: “MIP European Patent Reform Forum. 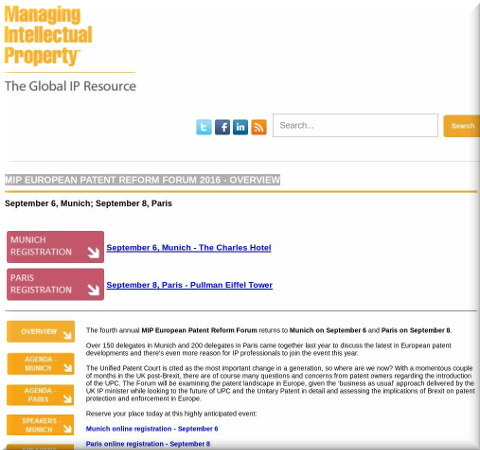 Managing IP’s upcoming European Patent Reform Forum will be taking place in Munich on September 6 and in Paris on September 8. There will be plenty to discuss this year, and with topics like the UPC and Brexit on the table the forum and dialogue promise to be exceptionally interesting. The programmes also offer presentations on FRAND terms, enforcement and evidence of infringement from an impressive selection of speakers, so this event is really not to be missed. “It’s the kind of congregation that’s typically encouraging collusion and/or conspiracy against public interests and with fees so high (over a thousand pounds for just a little chair… for one day) don’t expect public interest groups to attend.”“Why is it that,” asked one person, an attendant “who works in-house in a multi-billion dollar global company, get to attend for free?” Well, Team UPC and others inside the patent microcosm wish to be of influence for big businesses and for big money (they are, after all, their biggest clients). These events are, in practice, primarily about making connections in corridors and behind closed doors. The fee lets one brush shoulders and make contracts/contacts with potential clients, partners, officials etc. That’s just how lobbying works, too. It’s the kind of congregation that’s typically encouraging collusion and/or conspiracy against public interests and with fees so high (over a thousand pounds for just a little chair… for one day) don’t expect public interest groups to attend. It’s worth noting that FRAND, which is against FOSS, will be discussed at the event. Will there be any opponents there? Opponents of FRAND? Unlikely. It’s an echo chamber. Having mentioned Lucy Neville-Rolfe just a few days ago, it’s worth noting that the above from IP Kat takes note of her too. She is considered the person to influence (or lobby) right now.